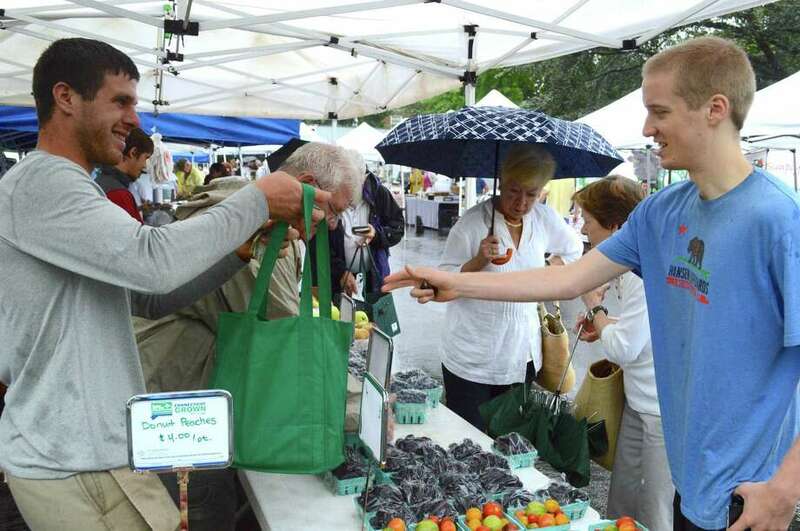 Regular Jimmy Baker of Darien makes his weekly berry purchase from Jesse Teveris of Woodland Farm of South Glastonbury at the weekly New Canaan Farmers Market on Aug. 11. Tee up or — as a new option — return serve in support of the Maritime Aquarium at Norwalk on Sept. 17 as the Maritime Golf Classic now offers an optional tennis tournament. Registration is open now for the eighth annual Maritime Golf Classic, a fundraising event at Wee Burn Country Club in Darien. New this year is a concurrent tennis tournament on the country club’s courts. Both are coed. This annual tournament supports the Maritime Aquarium’s mission through the continuing exploration of animal and conservation issues in Long Island Sound and the oceans beyond. In addition, funds raised help provide STEM-focused education opportunities to area students, regardless of their ability to pay. Opportunities for the golf half of the Maritime Golf Classic include: $10,000 as naming sponsor with two foursomes and two hole sponsorships; $4,000 for a foursome; and $1,000 as an individual player or hole sponsor. The tourney begins with registration/bag drop at 10:30 a.m., a barbecue lunch opening at 11 a.m., and then a 12:30 p.m. shotgun start. Carts and refreshments are included. The golf and tennis tournaments will conclude together, with cocktails, dinner, silent auction and awards beginning at 5 p.m.
Chairman of the golf classic is Charlie Hinnant, of Rowayton, a member of the aquarium’s board of advisors. Sarah Ritchey of Wilson Point is chair of the tennis tournament. For details and to sign up, visit www.maritimeaquarium.org/signature-events or call 203-852-0700, ext. 2277. This September, there is a monthlong exhibit at the Geary Gallery in Darien titled “Bold Dimensions,” featuring the abstract paintings of Greenwich resident Graham Miller. The Gearys will also host a special “Meet the Artist” event on Sept. 20 from 6 to 8 p.m. All are invited to meet with Miller and to garner insights about his works. His exhibit runs from Sept. 1-29. Admission to the gallery and event are free to the public. Miller is an artist who conveys an intensity of boldness and strength in his paintings. His work can also be described as patterned, dimensional, and structural with his signature technique of intricate splatterings. Gathering inspiration from Jackson Pollock, Mark Rothko, Franz Kline and other contemporary artists, Miller also credits his world travels, especially across the United States, Europe, and the Caribbean as equally inspiring. Miller was born in New York City, and lived for many years in Darien before moving to Greenwich. He received his bachelor’s degree in fine arts from Ohio Wesleyan University. His work is displayed in public and private collections throughout the tri-state region and he can be commissioned for artwork. Geary Gallery is open to the public Tuesday through Saturday, 9:30 a.m. to 5 p.m., and is located at 576 Boston Post Road, Darien. For information, call 203-655-6633 or visit www.gearygallery.com. SoundWaters HarborFest will take place Aug. 25 from 10 a.m. to 6 p.m. on the boardwalk at the Harbor Point Waterfront at 2200 Atlantic St. in Stamford. There is free parking in the Harbor Point garages and parking lots. The featured event of HarborFest is the Aquarion Cardboard Kayak Race. Teams will receive sheets of cardboard and rolls of tape and have two hours to build a two-person kayak. Two members of the team will then race their kayak on the harbor in front of hundreds of cheering spectators. The race is great for friends, company or family teams. There are still spots available; register at SoundWatersHarborFest.org. Registration costs $100 per team, but is free for student teams. Attendees can also learn to scuba dive. Equipment and experts will be on hand during HarborFest. The pool comes with dressing rooms and diving equipment, including wetsuits and fins for all ages. Minimum age for diving is 10 and divers 11 and under must be accompanied by an adult also trying scuba. The Go Dive Now pool is free and will be open on Aug. 24 from noon to 4 p.m. and during HarborFest from 10 a.m. to 6 p.m. The 10th annual “Pray For Peace” walk will take place on Sept. 9 from 1 to 3 p.m, featuring three routes all leading to one destination. The event is free of charge. Stamford resident Al Forte has hosted this and many other “Pray For Peace” walks in New York, Boston, and Chicago. “No God, no peace. Know God, know peace. Prayer and a desire for peace are essential for us, and this walk will spread the message of praying for peace,” Forte said. On the theme of “Now More Than Ever,” this year’s walk is intended to raise awareness for the need for peace in ourselves and the world, by spreading the message of praying for peace in a public sphere. Eighteen houses of worship are along the three routes and are being encouraged to invite parishioners to join in the walk. The walk routes are from North Stamford, Greenwich and Darien, all culminating at St. John’s Basilica church in downtown Stamford. Each route is approximatly 3 miles long. Refreshments will be provided at the church for fellowship. For information, contact Al Forte at ajfortejr10@gmail.com or call 203-940-3651. Garo Balian, of Darien, graduated from the University of Albany with a bachelor’s degree in psychology. Caroline McGuire and Anne Sullivan, of Darien were named to the spring 2018 semester dean’s list at Union College.